The ability of families to build up a financial cushion that can be tapped without penalty or restriction to meet unexpected expenses is a primary determinant of financial security and a key to future economic mobility. Being able to access flexible savings when expenses exceed income prevents an over-reliance on debt, decreases the likelihood of experiencing hardship, and promotes advantageous asset building over the long term. Yet many families are unable to amass even a small pool of flexible savings that can make a difference. Current public policy creates unnecessary barriers and offers insufficient incentives to support families in the process of accumulating strategically useful savings. 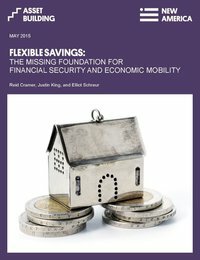 The lack of flexible savings is a problem not only for lower-income families, but affects households at nearly all levels of income. While policy supports to help families build certain long-term assets, such as retirement savings and home equity, do exist at the federal level, there are no federal policy provisions to support flexible savings. Perhaps worse, families are penalized when they are forced by circumstance to draw down on their own savings that have accumulated in tax-preferred accounts. In light of growing evidence about the extent of financial insecurity among American households, policymakers should consider ways to support families’ efforts to build flexible savings.